Evo: Set of 2 Oil Sprayers - 8 oz. An ergonomically designed oil sprayer that can be used with most cooking oils for a healthier alternative to aerosol cooking sprays. The unique fan-shaped spray is made to cover more surface area while using less oil. Can also be used with balsamic vinegar, lime juice, and cooking wine. I haven’t used them a whole lot, but I like how easily they spray. Such a nice spread out stream! Spray bottle works great. Gives the ability to have a small amount of EVOO without overdoing it! 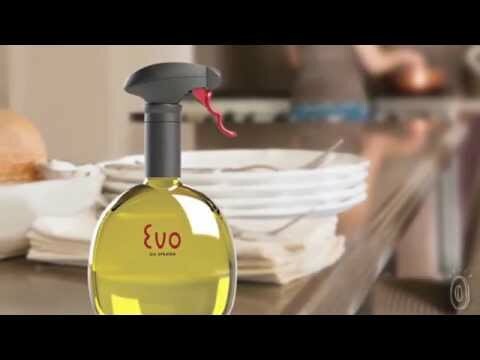 Evo is the first non-aerosol trigger sprayer designed especially for spritzing foods and cooking surfaces with oils or vinegars of your choice. Simply fill Evo with your favorite cooking oil and pull the ergonomic trigger to deliver a consistent fan-shaped mist with precision and ease over everything from meats and vegetables to pots and pans. Created by Michael Graves Design Group, Evo sprays exactly 1.35 milliliters with every trigger pull. No priming, no pumping, and no artificial propellants necessary. Although Evo was initially intended for use in commercial kitchens, its at-home appeal quickly became clear and an elegant BPA-free bottle design followed. Aesthetically-pleasing enough to claim a permanent place on your countertop, Evo is also slim enough to store in the fridge. With Evo, one spray goes a long way eliminating the need for extra brushes and utensils and enhancing your meals with natural flavors.